Dogs as always symbolize loyalty and affection. The infamous puppy dog eyes have been used almost by all of us at one time or the other. 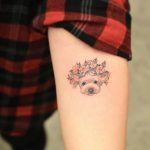 Now you can use dog tattoo designs instead! 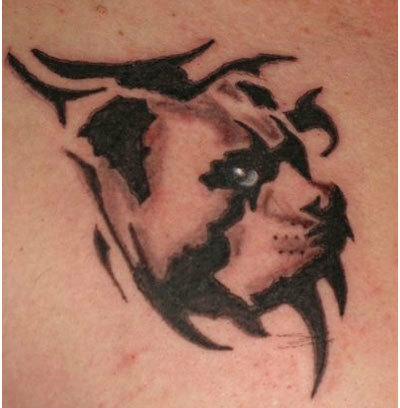 The tattoo designs vary from ferocious and very manly dogs to cute little Chihuahuas for the girls. 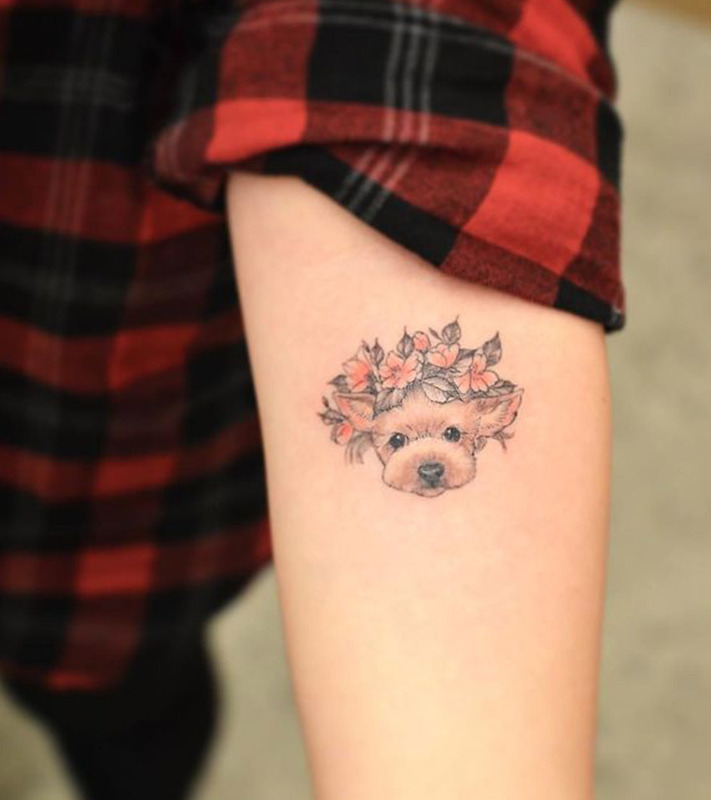 More often than not dog tattoos are a way for dog lovers to show their love for their cute little pets. Dogs are the best friends for humans and well, most people do all sorts of crazy things for friends! 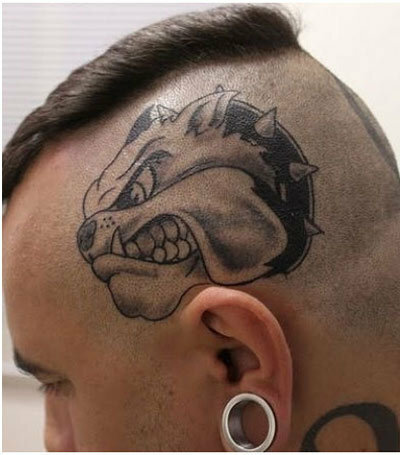 This tattoo is the one with puppy dog eyes goading you to go, “Awww”. Cute and gothic, it’s also cool and worth the pain. 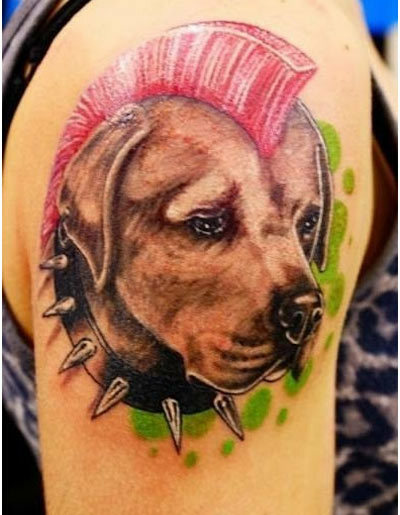 This tattoo depicts dogs are not be messed with. The black and white look enhances the ferocity of the dog and its look. This category includes all the depictions of Alsatians. It generally includes the head with the beady eyes and sharp teeth. 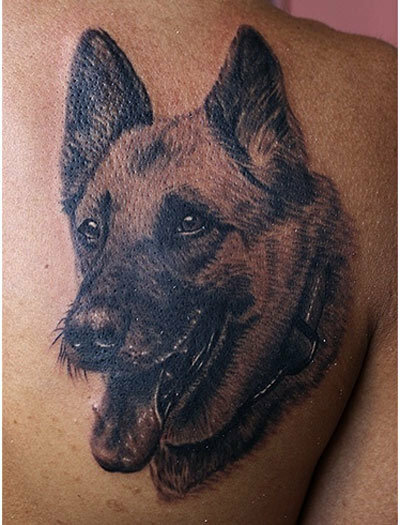 Funky to look at, it’s a cool tattoo to have, especially if you own an Alsatian and love it very much! 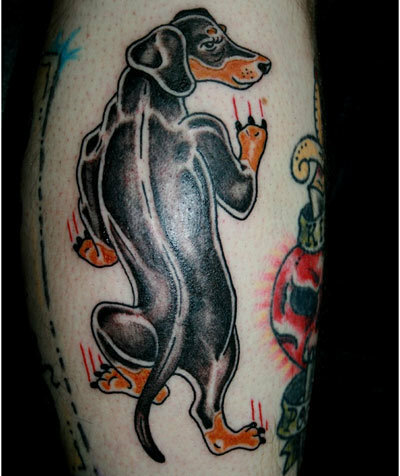 This is the tattoo of the full length of the dog, made generally down the length of your arm or lower leg. It is tall and generally black and white though colours are often used too. This breed of dogs is almost as famous as is its tattoo! After the children’s story 101 Dalmatians, this breed has received tremendous publicity making it one of the most common kinds of pet dogs. These tattoos are generally coloured with backgrounds around it. 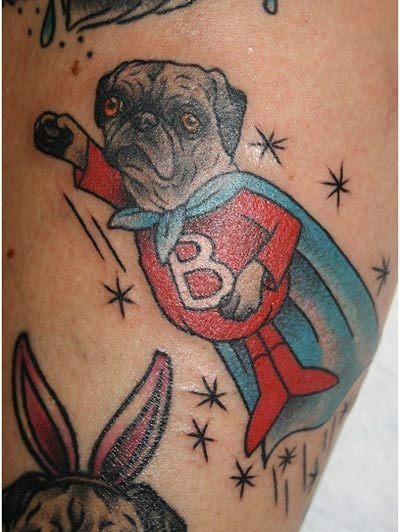 Pugs are the most commonly depicted dogs in tattoos. 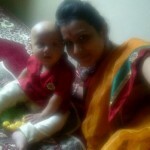 They are made in different actions and sizes and they generally include the entire body. The wobbly kind is the most famous. The superhero pug is also a common kind. This kind includes dogs that have been modified to give them a more human look. They are often made into kings, squires, court men and so on. They are spectacular pieces of art and very realistic to look at! There are black and white tattoos and there are coloured tattoos. Many of the coloured ones include proper backgrounds behind them and are very aesthetic. They are pleasant to look at but surprisingly not very common. 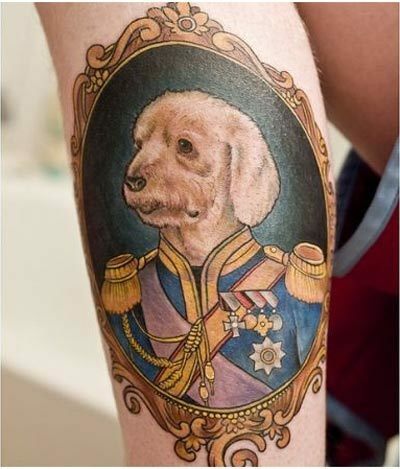 This is the tattoo kind of dog. It does not have a very realistic feel but it certainly looks good. It is funky and in the format of tattoos including just black broken lines. 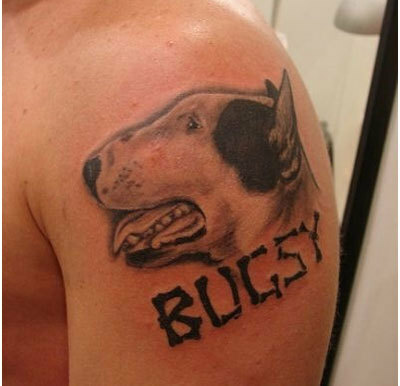 This is the most common kind of dog tattoo. 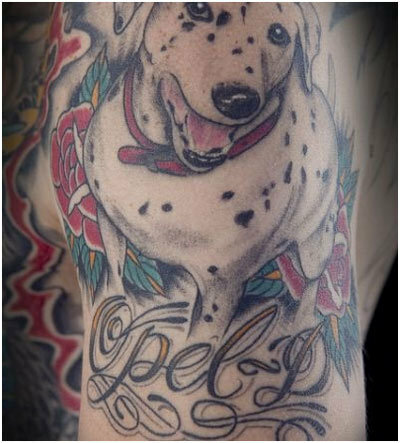 This is the kind of tattoo which is inspired by a pet and generally features the pet’s name along with its picture. It is very realistic and very common as it depicts your undying love for your pet dog the best! 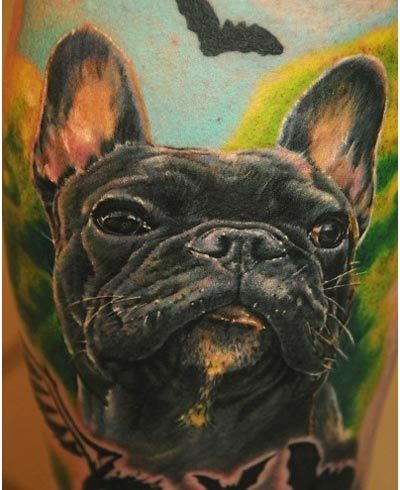 Hope you loved these dog tattoo ideas. The perfect way to get them inscribed if you are both a tattoo and dog lover. If you have any thoughts to share with us, you are free to comment below. Tattoos can be an easy influence, give your tattoo idea sufficient time before you fix on it.